In this article, we will learn about three important classes ArrayList, Vector and HashMap from Collections Framework and start using these classes in our code. Using ArrayList and Vector classes we can treat a group of elements as a single object and manipulate it with the help of various methods that are available in these classes. ArrayList and Vector classes are available in java.util package. HashMap is another class, available in java.util package, which maps key and value. It helps us retrieve the value when key is known. Let us look at these classes and its usage one by one. Step 1: In this Step we will write a simple program which uses ArrayList. In the above program, we are importing ArrayList class, which is the first line of the program. Then we are initializing, an array of string which contains some names and an arraylist of generic type. The method ‘includeCharacters(args) ‘ can be divided in to two sections. In the first scenario the elements are added from the array to the list, by means of a loop. In this case, the elements are added to the ArrayList in the same order as it is in the array. This is because we are not defining any position for the element that is to be added in the list. But in the second scenario, the elements are added with an index specification. In this case the element is added to the arraylist at the specified index. When a new element is added to the ArrayList, the elements which were already in the ArrayList gets pushed down to the next index, from their respective positions, thus increasing the size of the ArrayList. Because the array has 8 elements, which is added to the ArrayList, and then we are explicitly adding 2 more elements, thus making the size of ArrayList 10. 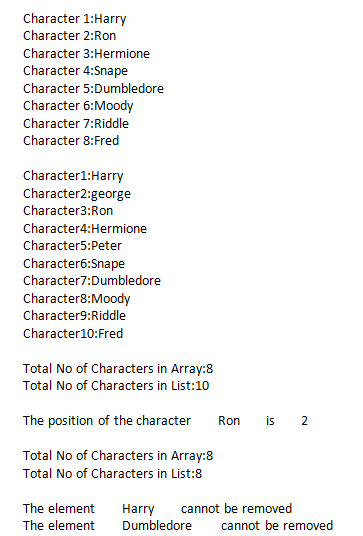 The method ‘getCharacterPostion(args) ‘ accept a string and displays the position of the string in the ArrayList. If the string is not at all available in the ArrayList then the output will be ‘-1’. Because the removeCharacter(args) is conditioned to execute only if the size of the arraylist is greater than the size of the string array. Step 2: In this Step we will write a simple program using Vector class. The above code is just a sample to prove that there is not much difference between an ArrayList and a Vector. A Vector can be manipulated like an ArrayList with the same methods. Step 3: In this Step we will write a simple program using HashMap class. In the above code, we have a string array with some book names. The method ‘mapAuthors()’ maps the book names with its authors. Here, book names act as key and author names act as values. When ‘getBookList()’ method gets executed it iterates the ‘Books’ array and gets the book names one by one. The method checks whether the book name has got any author. As we can see if the method could not find an author for a book, it prints a ‘not available’ message. Else it prints the required output one by one. In this article, we have learnt about Arraylist, Vector and HashMap classes and also used them in our own code.